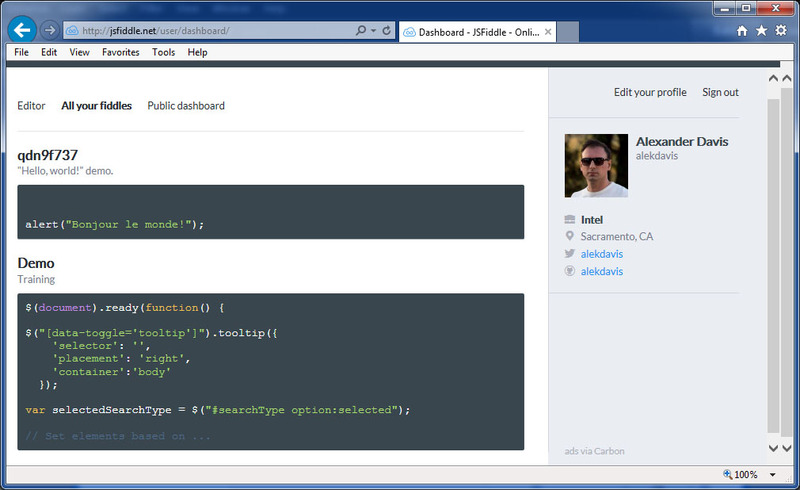 Summary: How to use jsFiddle for building wireframes and rapid prototyping. Recently, I needed to build interactive prototypes of a web form. I do not own a license of a professional prototyping tool (like Balsamiq, HotGloo, UXPin), so I tired several free online options (namely, iPLOTZ, concept.ly, MockFlow) and appreciated the ease of drag-and-drop; however, making these prototypes respond to interactive events (mouse clicks, selection changes, etc) turned into a hassle. I also tried a couple of desktop options, but had even less luck with Pencil (couldn't figure out how to make a combo box display multiple entries), Visio 2013 ("Where is the combo box, Lebowski? 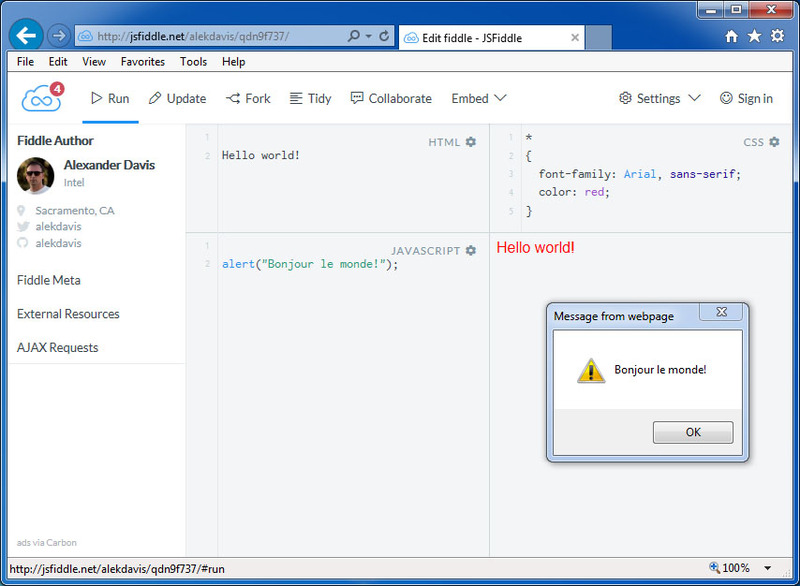 "), and Blend for Visual Studio 2013 ("You're entering the world of pain!"). It's free (as in "it ain't cost sh*t"). It's web-based (no crap to install). It's not using Adobe Flash, like most other online prototypes do (they still do, don't they?). It uses a standard web programming model (no need to learn proprietary controls). It keeps versions of your changes (version control by default). You can send a URL of your prototype for a review or do a live demo (with some quirks, though). You can collaborate with others on a prototype (although, I haven't tried). Create an account (if you don't have one). Log in and open the editor. While in the editor, under the Fiddle Meta section on the left side, enter the title and description of your prototype (wireframe). If you do not want to make it public (discoverable via search), leave the title field blank. Click the Run menu option to preview the functionality. When you are happy with the result, click the Save (or Update) menu button to keep the changes. The public link to the fiddle can be found in the Embed Code section of the Embed screen (to open the Embed screen, click the Embed menu option). Now, a bit of jsFiddlespeak, if you do not mind. Visibility: You may have noticed somewhat non-traditional use of the term public. As I mentioned above, public means that a fiddle can be found via a search, and non-public means that to access a fiddle, someone must know the fiddle's URL (non-public fiddles are still open to public). You can define any version as base by opening this version in the editor and clicking the Set as base menu option (in certain cases, you may need to save the version first). Finally, a few tips to help you get most out of jsFiddle (these are mostly notes to self, but others may find them handy). Summary: Windows batch script to generate timestamp for a filename. People who write Windows Shell (AKA batch or .BAT) scripts for living sometimes need to create file (or directory) names using timestamp values based on local current date and time. This is not as trivial as it may sound. First, there is no shell command that would return a timestamp in a custom format, and the standard command may return a value containing illegal (for filenames) characters, such as colons. There are articles that address this issue, but many proposed solutions do not accommodate region specifics, so they may work for an OS configured for one region, but fail for another. rem End of the main routine. rem out the alternate implementations. How to get current datetime on Windows command line, in a suitable format for using in a filename?